Surface Resistance Meter_001-0385 The Model: 001-0385 measurements of both surface resistivity and resistance to ground.Giving simple repeatable measurements of conductive,static dissipative and Insulative surface.The checker employs the ASTM standard D-257 method of parallel bar sensing.Ranging is automatic due to the use of high speed OP-AMP Integrated circuits being linear,with changeover points + or – 1/2dcade on a logarithmic scale (lor-10% from mean value per unit). The Model: 001-0385 measurements of both surface resistivity and resistance to ground.Giving simple repeatable measurements of conductive,static dissipative and Insulative surface.The checker employs the ASTM standard D-257 method of parallel bar sensing.Ranging is automatic due to the use of high speed OP-AMP Integrated circuits being linear,with changeover points + or – 1/2dcade on a logarithmic scale (lor-10% from mean value per unit). 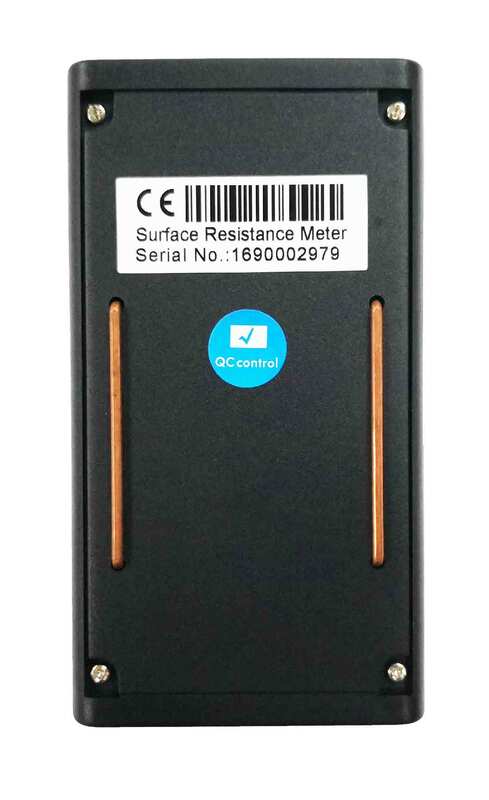 Remove the battery compartment and panel and check that a good quality PP3 Alkaline battery has been fitted.Hold the checker away from any surface and press the test button;the Insulative red LED light. Place the checker onto the surface that requires testing,again press the test button and hold.The LED that illuminates constantly is the decade measured. Insert the ground/Earth leakage lead into the ground/Earth leakage socket. This is the latest test probe on the right side of the meter. (the same blue as the socket).Connect the croc clip to your ground connection. Place the checker on the surface to be tested, press and hold the test button. The LED that illuminates constantly is the decade measured. 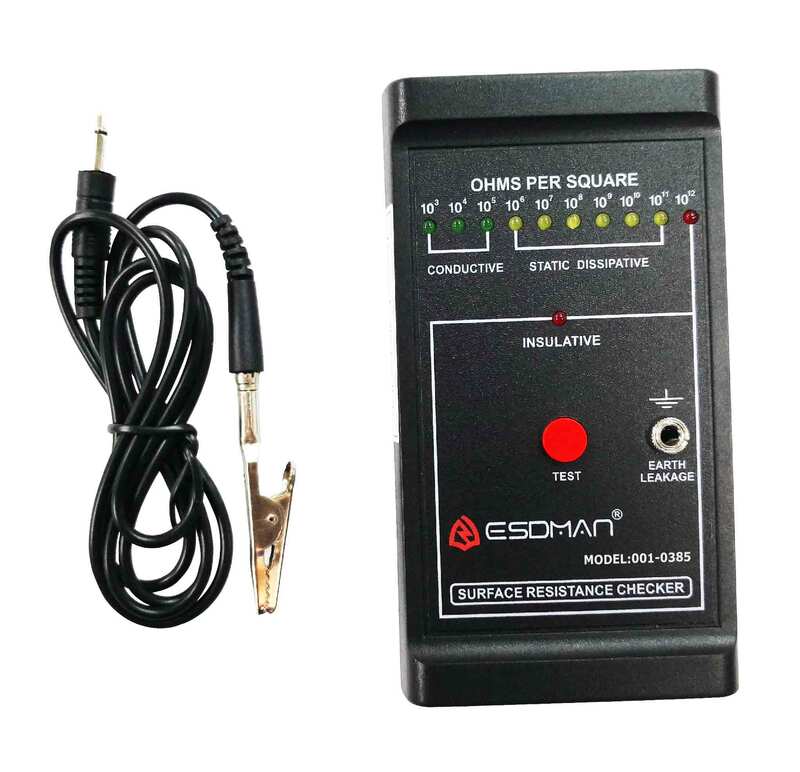 The measurement will be resistance to ground in ohms instead of ohms per square. The checker should be calibrated on average every 12months.A test resistance can be applied across the parallel bars to verify if the checker is within specification, using a resistance decade box. Calibration can be obtained by contacting your supplier. 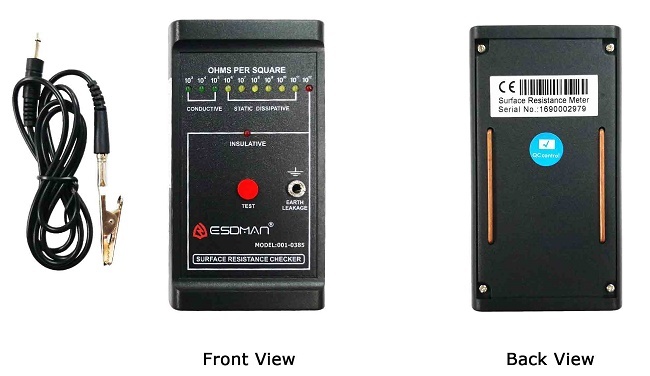 This product has been produced using 1% metal film resistors and high speed OP-AMP Integrated circuits.The calibration procedure is based on linear technology. Its changeover points are determined on resistance and +or-1/2 decade on a logarithmic scale i.e. (3.16×10n).The linearity of the Changeover points are +or-10% from the mean value per unit. The resistance decade box required will need a range of from>1kilohm up to 999 meg ohms or 10/9.Measurements greater than 10/9 are calculated using cad generated techniques,as high resistances greater than 10/9 are difficult to verify with a test voltage of 9vlots.Connect the test leads t\from the resistance decade box to the two test probes of the checker.Set the decade box to the desired resistance i.e. 10/3=1K,then press and hold the checker’s test button,the 10/36 LED should light,10K,10/4LED should light and so on.TO measure the changeover point between decades,increase the resistance of the decade box whilst pressing the checker’s test button. Record the resistance when the next LED lights permanently(this is the changeover resistance). 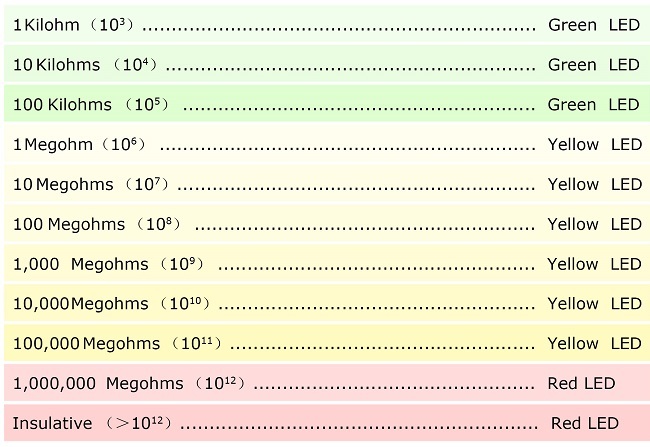 Example:The first green LED is illuminated 10/3=1 kilohm.At 3or 4kilohms 10/4 LED is illuminated the changeover point is 3or 4kilohms,10/4=10 kilohms so between 3or 4 kilohms and 30or 40 kilohms will be the changeover points from 10/4 to 10/5.N.B.Please note that the checker has no internal parts to adjust, so verification of calibration can be achieved using the above process.